Learn about an award-winning initiative that’s helping Boost take employee engagement to new heights, and see how you can apply it to your team. Boost is a freedom-centred democratic workplace. We know we can maximise our impact by empowering the whole team. One of the ways we do this is via our Culture Posters. This initiative won us the WorldBlu Top Practice award in October and has fed into a significant increase in our employee engagement metrics. The Culture Posters are part of our one-on-one process. Each fortnight, everyone at Boost has a employee-centred one-on-one session with a coach. These give us all the chance to drive our own professional and personal development, discuss opportunities and issues in a safe space, and give and receive feedback. The Culture Posters help Boosters jointly create Boost’s culture. They provide a structure to our one-on-ones, and help us find ways we can make sure our colleagues love working at Boost, and deliver amazing outcomes for our clients. Each poster is set out in the same way. They feature an illustration of the team member and their mission. 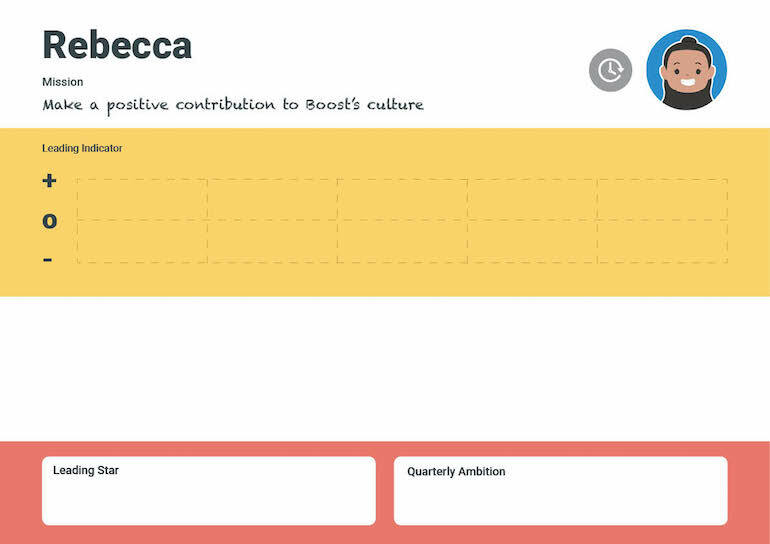 For most people this is “to make a positive contribution to Boost’s culture”. a post-it with space for both employee and coach to give brief reasons behind the plot for that fortnight. The physical act of plotting and describing the positive contribution is a good way of prompting more detailed conversations as well as reinforcing the value that each employee offers Boost. And our purpose is “Supporting others to create a positive and lasting impact”. The bottom section of the poster is to track the employee’s goal. They choose their own goals and can change them if the goal no longer meets their needs. Leading Star — the overarching ambition. Quarterly Ambition — the main focus for that quarter. Stretch Goals — the fortnightly steps they can take to move towards the previously mentioned two. We openly display these goals so they are easy to track and so other team members can offer support if they see an opportunity. This means we can all show our appreciation in the way that has the biggest impact. Every month we use the TinyPulse employee engagement tool to ask the team how happy they are at work. To keep ourselves honest we automatically display the running average of our past four surveys on our website. Since setting up our one-on-ones in mid-2016 our average team happiness scores have often exceeded 9 out of 10, up from 7.8 in July 2016. Our last result in October was 8.8, compared to an industry benchmark of 7.6. 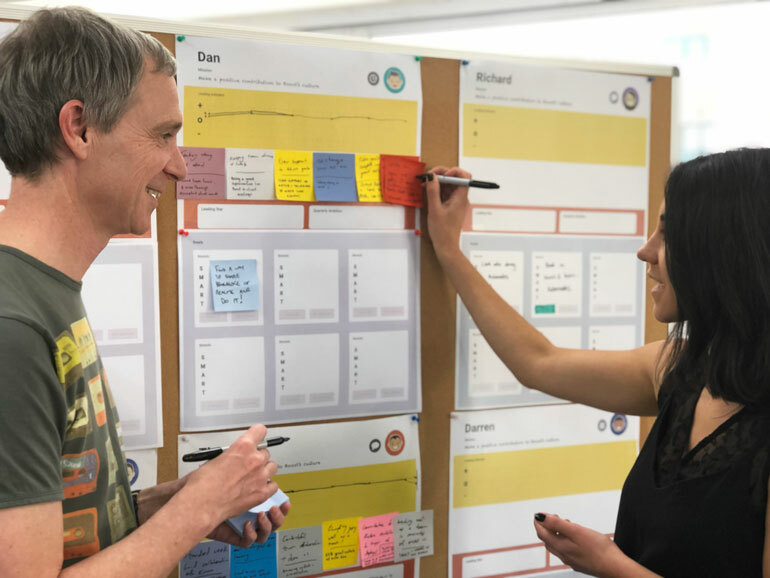 We’ve found that our Culture Posters, and the processes that they embody, have been an important contributor to our quest to make Boost the best place to work in New Zealand. We hope you find some or all of these approaches useful, and that they make a difference in your workplace too.